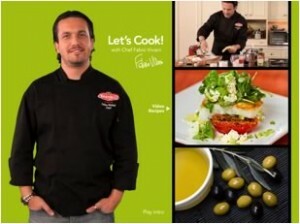 Fabio Viviani of “Top Chef” Lauches New iPad App, Let’s Cook! Top Chef fan favorite Fabio Viviani has now put his unique spin on a cooking app for the iPad. He's partnered with Bertolli Olive Oil to create an app called Let's Cook!, which showcases his Italian and Mediterranean-style recipes. Sixteen feature recipes can be found in Let's Cook!, all with full-color photos and complete instructional videos hosted by Viviani himself. Each recipe includes one of three varieties of Bertolli Olive Oil. Ingredient enthusiasts will also like the app's olive oil section, which compiles over one hundred recipes chosen by Viviani that he feels really showcase the olive oil's flavor and presence in the recipe. A few nifty add-ons from this app collection include the ability to instantly email a recipe's ingredient list, wine pairings, a search option, and social media sharing capability via Facebook and Twitter. Also, once the app has downloaded, no internet connection is required to use it. Bertolli Olive Oil has also partnered with Viviani to launch its new WhereFlavorComesFrom.com website. Beginning today and ending August 31, visitors can enter the "Cooking Lessons with Chef Fabio Viviani Sweepstakes." One grand prize winner will receive a trip for two to L.A. so that they can get personalized, one-on-one time with Viviani in the kitchen. Additional entrants will receive prizes of the new iPad 2, Bertolli olive oil products, and the Let's Cook! app. Let's Cook! is currently only available for iPad users; apps for the iPhone and iTouch are still in the works.